Nader’s campaign is taking aim at Democratic presidential candidate Barack Obama in a new fundraising pitch. (CNN) - A presidential rival is fundraising off of Barack Obama’s decision to reject public financing for the general election, using the move to fuel allegations the presumptive Democratic nominee is a policy-shifting flip-flopper. But it isn’t John McCain. Barack Obama’s lead over John McCain increased by one point in the most recent CNN national poll when Nader, a perennial presidential contender, was included as one of the options. Ralph,please stay out of it,people dont want the truth,they would rather believe lies.They want to lay back and just enjoy it,like the weather. All you will do is get the worst of two evils elected like the last time. How can you be against government spending, but oppose Obama for not taking public financing. That is hypocritical in itself. Nader is a joke. He doesn't even deserve this blurb on CNN. go retire already. What a narcissist. Nader: The only presidential candidate to come out of hiding after doing nothing all year prior to making his big splash and expect legitimacy and adoration. Thanks for the seatbelt laws and consumer advocacy and protection, but you have no authority to criticize others when your own measures are lacking their own merits. As a life long democrat I can say for the first time that I am embarressed and ashamed of the democratic party and disgusted with Pelosi and Reed not standing up to Bush and their fellow democrats in both chambers to stop the funding for this illegal war. The democrats need to regroup and stop the money flow and stop the war. If they can't do this then I look for them to loose power in November. The point you are missing is that Obama lied, yet again. He realizes he can make more money through donations – bottom line. The federal funding was to limit campaign spending. 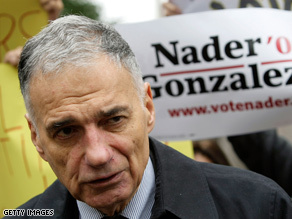 Nader is nothing more than a Republican running as a sidebar candidate for the Republican party. think about it. He knows that he will not and absolutely can not win and he also knows that when he runs he actually pulls from the Dems. The math always works for the Repubs. This man and anyone who would be dumb enough to vote for him are idiots. Like him or not he can not and will not win..let the big boys run the show and during the off season build your party. if you are truly trying to make a difference you wouldn't be doing this now you would have started at the end of the last election so that you would have already had a base, and a realistic shot. don't get me wrong I like the things that Nader has done for this country but he is not a true leader and the way he runs for office shows it. Most of Obama's fundraising is via Internet by individuals and especially young people, not big business or lobbyists. Shows how frustrated the common folks are with federal politics – everyone wants CHANGE at the top. It was Nader's spilt of the democratic vote that got us Bush to start with. I think this is a hugely self centered and self-serving move. It is painful for me to vote for John MaCain if Mr. arogant does not consider Hillary as his VP. Yeah, like swinging the election for the Republican. Imagine that. "If any of these clowns could raise half as much as Barack..."
Obama can raise and waste all the money he wants to. He outspent Hillary 4 to 1 in PA and STILL LOST BY DOUBLE DIGITS. This guy needs a hobby. Okay Nader, understand this my man. Taking the option to not accept campaign money from the government is not a policy. It's an option. Secondly, what is your primary stance as an independent? You ask for politicans to not accept money from PAC, Lobbyist, or the government but you slam Obama ??? You can't have it both ways pal.